These netbooks use ALC5632 audio codec plus mixer IC which has quite some amount of knobs and switches. 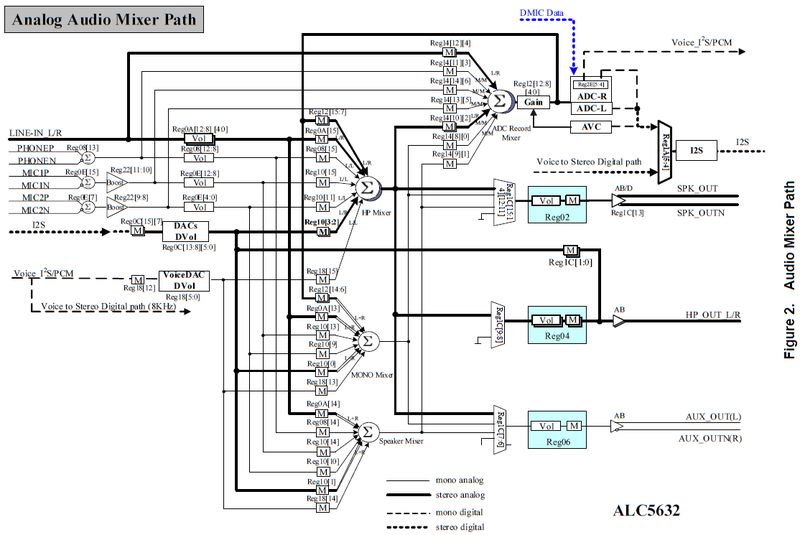 Most of them are available for direct manipulation with alsamixer, GNOME Volume Control and other applications that interact with ALSA mixers. Here ALSA control names are used, if you're using alsamixer or other similar software you will not see “Playback” or “Mux” in the control names, that is normal. Master and speaker playbacks should be unmuted and set to the desired level. Proper mono sound via MONO mixer or Speaker mixer is impossible to produce on unmodified hardware, see reversed_polarity_of_one_of_the_integrated_speakers for details. Luckily most usage scenarios do not require that anyway. You can swap polarity of connection of one of the speakers but then RN/-R would need to be used for the stereo output. To mute the internal speakers you can disable Int Spk or mute Speaker. Tweak DMIC Boost Volume and Rec Capture Volume to your needs. Tweak Mic 1 Boost Volume, Mic1 Capture Volume and Rec Capture Volume to your needs. Hence, you can save settings for internal speakers, headphones, mute all, etc. If you do not want to type all the above to restore just create a little shell script (name it e.g. setsound.sh) to do that for you.